From choosing window styles to the final installation, we’ll be there every step of the way. How do you feel about your windows? If they’re taking away from your home’s curb appeal or they’re costing you money due to poor installation, it’s time to consider the lasting value of Marietta replacement windows from Tight Line Exteriors. Our BBB-accredited, A+ rated business focuses on quality products and installations without compromising on an outstanding customer experience. We’ve even earned the “New Contractor Member of the Year” award from the Certified Contractors Network, so you can trust the quality of the service we offer to you and your family. Nothing beats Marietta bow windows when it comes to style. They can provide your home with a focal point both inside and out, and they improve your interior space with an unbelievable amount of natural sunlight. With a curved design that extends outward from your home’s exterior, you’ll also enjoy additional room for seating, storage, or shelving! Our Marietta window installation technicians are fully trained to ensure your bow windows are installed properly. We’re so sure that our windows will last that our products come with a limited lifetime transferable manufacturer’s warranty, in addition to a 50-year prorated warranty on glass. One of the best reasons to update your Marietta home windows is to upgrade to eco-friendly, energy-efficient products that reduce your carbon footprint. Our energy-efficient windows feature Low-e glass and argon gas-filled spacers that allow you to keep warm air inside in the winter and cool air inside in the summer. These features also will enable you to save big on your energy bills! Taking the first step towards replacing your windows can be a challenge, but Tight Line Exteriors is here to make the process as simple and hassle-free as possible! 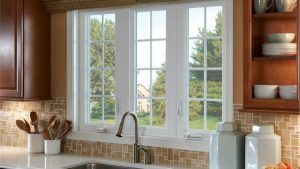 Find out more about the custom replacement windows we offer to homeowners throughout the region by giving our team a call today. You can also set up your free, no-obligation estimate now by submitting our brief online form.